The parents area in School Spider has lots of tools to communicate quickly and effectively with your parents. Not only are the tools useful, but they’re completely free! If you’re already using School Spider, everything in the parents area is all inclusive of your website package. One tool is your parents’ evening booking system, if you’re not already using this you are missing out! Drop those paper forms, full of scribbles and confusion and make yours and parents lives much easier. You need to have your parents area set up to use our parents evening booking system. This involves integrating School Spider with your school MIS. If you haven’t done this, get in touch with your account manager via hello@schoolspider.co.uk or 0161 635 0255. All parents will have their own individual logins emailed to them, they can then choose to download the app (via Google Play or Apple App Store) and or access the parent login via your website. Once you set up and send out your parents evenings, parents will receive an instant smartphone notification and an email to tell them they need to book a slot. Parents can choose to use the app to book their slot or via your school website. Parents want to change their slot? No problem! They just need to go back to their app or desktop login and they can click any other available slot to change their own bookings. Parents will receive automatic reminders to their smartphone 7,3,1 day before the parents evening to remind them to book or to remind them of the slot they have booked. You can set up and manage your parent bookings all in your School Spider administration area. 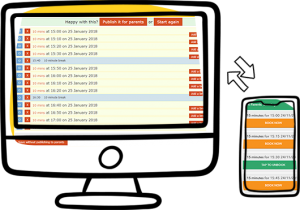 Have complete control over when the parents’ evening is, how long your slots are, how many slots you have and when you want the bookings to go live. If you need to you can also manually book parents slots . Once you’ve got all your slots booked, download a list of all bookings ready for the day of the parents evening. If you’re ready to set up your parents evenings, check out our YouTube tutorial with step by step instructions to set up your bookings. If you’re already using School Spider and would like some additional support, or if you would like to find out more about what we do get in touch on the information below and we’ll be more than happy to help.